The Friendship Theater is part of the town mockup at the Weinberg Village in the Ferber Kaufman LifeTown center. Friendship Circle International personnel from across the United States and Canada descended on the Detroit suburb of West Bloomfield, Mich., for the chance to inspire one another and strengthen efforts to increase awareness and acceptance of children with special needs. Held at the headquarters of the world’s first Friendship Circle – a Chabad-Lubavitch run program that pairs teenage volunteers with children with special needs – the annual conference touched on a variety of topics last week, including nonprofit marketing, legal issues, social media, grant writing and special education. Sessions explored strategies in recruiting, training and motivating volunteers, and in developing strong employee relationships. Home to the Ferber Kaufman LifeTown building, a 23,000 square-foot state-of-the-art facility whose centerpiece is a life-size mockup of a town square where children with special needs develop skills for functioning in society, the Meer Family Friendship Center Campus in West Bloomfield serves as a hub of activity for thousands of children with special needs, volunteers, professional staff, and supporters. Some of the conference’s attendees came from well-established Friendship Circles, while others were just beginning their endeavors. Rabbi Levi and Dassy Tennenhaus came to find ideas for expanding programs at the new Friendship Circle of South Broward County in Florida. Rabbi Peretz and Miryum Mochkin, directors of the Friendship Circle in S. Francisco, said this year’s conference was the first they’ve been able to attend together. 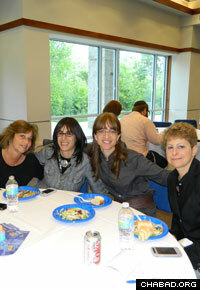 Ellen Maiseloff, left, associate director of special education for the Opening the Doors Program of Jewish Federation of Metropolitan Detroit, attends the Friendship Circle conference with Malya Shmotkin, director of Friendship Circle of Stamford, Conn.; Bassie Shemtov, LifeTown director for Friendship Circle of Michigan; and Lissie Rothstein, Hebrew school teacher and social skills camp director for Friendship Circle of Michigan. The last day of the conference included a supporters’ reception, where attendees, along with a group of Friendship Circle supporters invited by the directors in their respective communities, had the opportunity to tour LifeTown and its accompanying Weinberg Village. Richard and Bobby Rosner of Cleveland toured the facility with Cleveland Friendship Circle directors Rabbi Yossi and Estie Marozov. The couple was impressed with the various storefronts in Weinberg Village that provide an opportunity for children with special needs to experience real life situations such as getting a haircut, going to the doctor or visiting the library. “I had no idea what we’d be seeing, but this is something that would help children with special needs cope with everyday life,” said Richard Rosner. The grand finale was a presentation by Bassie Shemtov about a new anti-bullying campaign called “Defeat the Label,” aimed at eliminating the use of negative and pejorative labels such as “nerd” and “dumb.” The program includes weekly missions and prizes that are promoted online and by Michigan radio station 95.5 FM, a specially-designed line of clothing, and a school pilot program. Michigan businessmen Jeff Sakwa, Kevin Mendelson, and Kevin Goldman are helping to market and promote the apparel, which has been sold as far away as Scotland and Ireland. The program received a boost from Australian teenage singer Cody Simpson, who can be seen wearing a Defeat the Label sweatshirt in his latest music video. “The highlight has been to experience LifeTown, to see that such a world has been created. It makes you feel you’re part of a bigger team, a larger creation,” said Bentzion Groner. Walking through the West Bloomfield campus, Doonie Mishulovin, Hebrew school director and inclusion specialist for Friendship Circle in Los Angeles, was amazed.